According to a television commercial, Triples had "tasty rice crisps, hearty wheat crisps and sunny corn crisps for taste that could have you doing a triple-take." 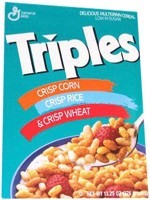 The cereal was heavily promoted as a replacement for Kellogg's Rice Krispies with lines like "if you like Rice Krispies, try Triples". What do you think of Triples? View all 48 comments for this cereal. Since General Mills brought back French Toast Crunch, maybe General Mills will bring back Clusters, Triples, Wheaties Honey Gold, original Oatmeal Crisp, Oatmeal Raisin Crisp & Multi Bran Chex for a whole new generation of cereal lovers and fans. 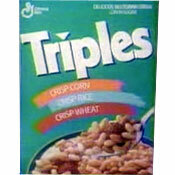 Could someone make a petition @ change.org to bring back Triples cereal from the dead? This was a great tasting cereal. I have 4 coupons with no expiration dates. Bring Triples back General Mills! I loved Triples too! Bring it back please! Found a recipe from the Triples cereal box GM used to make... Peanut Butter-Chocolate squares. This was a favorite with my son. I was wondering what cereal would be the best to make it with today since GM doesn't make Triples today. This was my favorite cereal growing up. I remembered it when I just bought a box of 'Crispy Rice' by 'American Breakfast' from Dollar Tree. It has the same level of sweetness and same texture, but it doesn't have the other two grains. I'd love it if someone would make Triples again. Triples was great until they 'improved' it. Before General Mills stopped making it, they kind of ruined it by making it more air puffed. It wasn't as crispy as it had been and I stopped eating it. Bring it back please! Triples was the ultimate cereal! 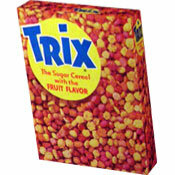 I miss this cereal! Please General Mills, bring back Triples!